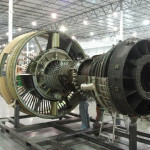 After a long journey, the 7E turbine arrived at GTC. This opens up a new chapter for our Gas Turbine Center, enabling our teams to work on a “real animal”. The 7E unit will be used for a huge array of tooling and inspection techniques development. Collocated RDC and Outage teams will also be working together on brazing and welding repairs to optimize existing repairs and provide custom solutions for GE customers. Having a real unit on a shop floor cannot be underestimated. It is a real “playground” for tooling and processes validation, as well as training activities dedicated to all GTC teams, including newly hired. It is also beneficial for Design groups to verify hardware arrangement and parts condition. 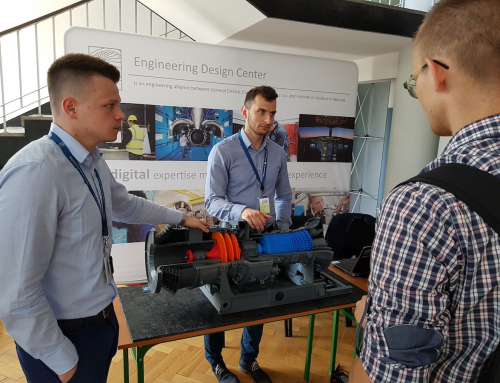 The 7E turbine will be a part of the global turbine simulator network that will be used by field engineers for training activities, and as a testing unit for real outage simulations. In the next few weeks the turbine and compressor casings will be removed and the whole unit will be placed directly on a shop floor. After that a scaffolding will be built around, to provide an easy and safe access to the turbine’s “guts”. The newly arrived 7E turbine was one of the two 7E units installed at The Power Generation Company of Trinidad & Tobago. The unit was built in Greenville in the early 80s. After its retirement in 2016 there were a few GE teams and third parties interested in having an ownership of it. Thanks to having the newly built GTC and a strategy for the upcoming years, it was decided to ship the unit to Poland. The turbine was first transported on a trailer from The Power Generation Company of Trinidad & Tobago to the city of La Brea, and then barged to Point Lisa. It was loaded on a vessel to Europe there. On June 16th the unit was unloaded in Gdańsk, and then transported to GTC on July 14th. The following day it was placed inside the turbine simulator hall (the part of GTC). Currently the works leading to align the turbine on the simulator hall’s floor are being carried out.